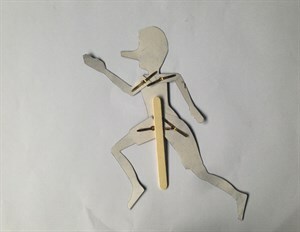 Pinocchio is a great example of how puppets can come to life and he's inspired us to create shadow puppets that you can put together at home. 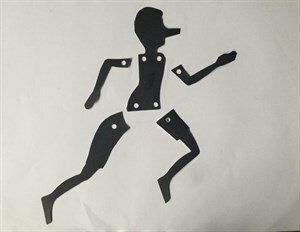 Download the Pinocchio shadow puppet to print at home, or purchase a Pinocchio program at the Sydney Opera House foyer when you come to see the show to get the full range of characters (Pinocchio, Geppetto, Blue Girl and Stromboli). Kids beware of sharp scissors! 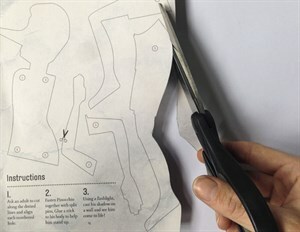 Ask an adult to help you cut along the dotted lines of each part. Use a hole puncher to punch out the circles where marked. 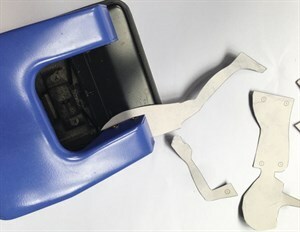 Tip: Careful to hole punch on the dotted circle. 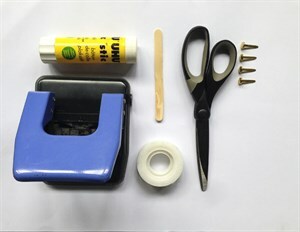 If you miss, wrap sticky tape over the mistake and punch again. Turn the puppet over and get your puppets limbs in order! Align each arm and leg with the body - we suggest you use the arrangement above, but your puppet can be wackier if you like! We are using Pinocchio, but you can also get Geppetto, Blue Girl and Stromboli from the Pinocchio program available for $10 in the Sydney Opera House foyer when you come to see the show. 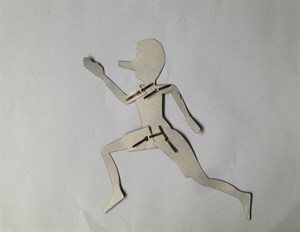 Fasten the limbs to the body by pushing a split pin through the hole and folding back the arms of the pin. No split pins? No worries! If you don't mind your puppet being a bit stiff, a stapler will work just fine. Glue or tape your stick to the back of the puppet, leaving enough stick at the bottom to hold. String up a white sheet or large piece of white paper as a screen. Stand behind the screen with your audience in the front of the screen. Place a strong light just behind you and the screen - a lamp or torch. Get your puppets ready to perform, and turn on the light. Enjoy the show! Or, you can have just as much fun by casting shadows on the wall with a torch or even the light from a mobile phone! Tip: Play around with the angle of the light to change shapes and sizes! Have you made your puppets? Take a picture and tag us on Facebook, Twitter or Instagram. #sydneytheatreco #STCPinocchio.